Surprise! Even though it looks like an impact crater, it is not. 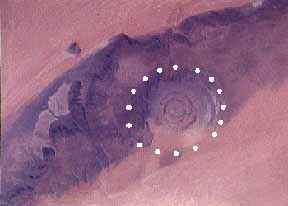 The "bull's eye" is called the Richat Structure, and it was formed by volcanic processes. It is a very large and eye-catching feature and has been photographed often by astronauts. But don't feel bad. Everyone thought it was an impact crater until a ground expedition went in and found no evidence of impact, only evidence of volcanism. This one was included to let you know that not every circular feature on Earth is an impact crater. You really need to visit the feature on the ground in order to observe its structural features and obtain rock samples. Only then can you be sure of what you have. So be careful. Weigh all evidence carefully!